At Leicester Grammar School, London Road, Leicester LE8 9FL. Under-9, Under-11, Under-14 and Under 18 tournaments, 6 rounds. 30 Mar, ECF reports. The full draw is on the county teams' national page of this website. Lincs get a bye and free pass into the Minor Counties semi-final. Warks had to decine their nomination for the u120 and are replaced by Derbys and Worcs decided not to enter the u180 competition. 23 Mar. With a chance to become Midland champions, Leics lose to bottom placed Worcs. In the u140, Lincs beat Staffs. 23 Mar, Peter Sherlock reports. Worcs decided to withdraw from the u180 competition, Derbys replace Warks in the u120 and Notts confirmed as the third nomination for u100. The national stage rounds are scheduled as shown on the national web page of the this year's county matches. 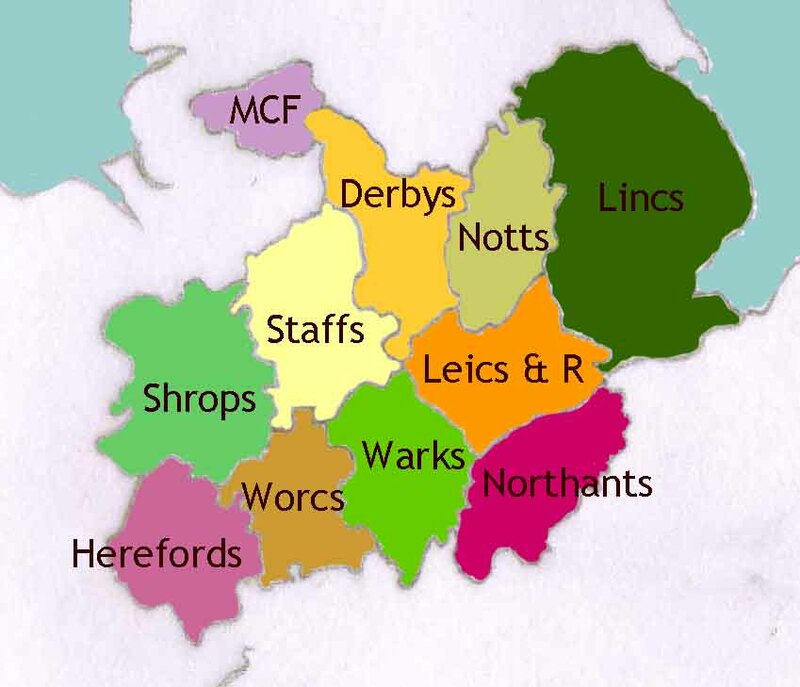 The full list is: Open MCCU1 Leics, MCCU2 GMC; MinorCounties MCCU1 Lincs, MCCU2 Notts; u180 MCCU1 Warks; u160 MCCU1 GMC, MCCU2 Notts; u140 MCCU1 Worcs, MCCU2 Notts, MCCU3 Leics; u120 MCCU1 Notts, MCCU2 Derbys, MCCU3 Staffs; u100 MCCU1 Warks, MCCU2 Staffs, MCCU3 Notts. Players in the national stages must be ECF members (in the Open gold membership) and captains are reminded to obtain from the national controller clearance for all ungraded players in grade limited sections. Good luck to all Midlands teams! 17 Mar, Peter Sherlock reports. MCCU have nominated at least two teams in the Open and each of the grade limited competitions. The u140 and u120 sections have three nominations and Notts have asked for a reserve place if available in the u100. 16 Mar, Peter Sherlock reports. In the hotly contested u140 competition, Warks had a narrow home victory over Derbys. This weekend’s result means that Leics take the final Midlland’s place in the national stage. 9 Mar. The end-of-season u120 match between Warwickshire and Nottinghamshire was crucial, but Warks needed a win whereas Notts only a draw. With a board down, Notts squeaked the draw. 9 Mar, Neil Graham reports. In the battle for the remaining two MCCU nominations for the national stages, Warks and Staffs just edge out Derbys. 2 Mar. In the u140 showdown, Worcestershire emerged victors, leaving two team to fight for the third nomination for the national stages. In the u100, Warwickshire had a convincing win against Staffs u100 to maintain a 100% set of results. 2 Mar. Leics beat Notts in the championship so the result of the final match of the season will decide whether Leics or Notts are champions. 23 Feb. In the u140 competition, Notts set up a championship showdown with Worcestershire next weekend with a win against Leics while Lincs beat Warks. In the u120, Worcs pick up a match point with a draw against Staffs. 9 Feb. Worcs u140 team book their place in the national stages with an away draw against Derbys. 2 Feb. Notts beat Worcs in the championship to join Lincs at the top of the table. Notts beat Leics and go top of the u120 table. 13 Feb. Solihull blaze a trail for ’Fischer Random’ rapidplay with an open tournament on 10 March (see top right). There will be grading prizes for ECF rapidplay graded players, but because Chess 960 is a chess variant, results in this tournament will not be graded. 27 Jan, Rod Middleton reports. Adam Ashon (3Cs, Oldham, GMC) and IM Joseph McPhillips (Bolton, GMC) were first in the Open with 5 points from 6 games. Phillip Seery (Bare Inst, Morecombe, Lancs) won the Major, Michael Norris (Manchester Mantihores, the Intermediate and Denzel Supatan (Bare Inst, Morcombe, Lancs) the Minor all on 5½ points. Just under 150 players took part. 26 Jan. In the u140, Worcestershire beat Lincolnshire and remain unbeaten. Derbys beat Warwickshire in the u120. In the u100 Staffs beat Leics in an 11-board match. 19 Jan. Manchester beat Notts to claim the u160 Midlands title. 19 Jan. In the championshp matches, Warks beat Worcs and Lincs beat Leics. 12 Jan. In the u140, Staffs beat Derbys and Lincs beat Notts and in the u100 Notts beat Staffs. All three matches were close results. 5 Jan. In the championship, Leics beat Warks while in the u120 competition, Notts beat Derbys and Warks beat Staffs. Click "News" on the menu bar above for other recent items. Sat & Sun 13 & 14 Apr. 4NCL Div 3 and 4 South Rounds 7 & 8 at Mercure Daventry Court Hotel, Daventry. Sat 18 May. ECF County Championship quarter finals. Various locations. Eleven "Chess Counties" form the Midland Counties Chess Union and cover the areas shown in the map on the right. A small Board of volunteer directors currently led by Chief Executive Ray Dolan (Staffs) is elected annually by delegates from member chess counties. The Board organises regional competitions based on policies agreed annually by delegates from member chess counties. By playing in the competitions hosted on this website you agree that your name, chess grade and your membership status with the English Chess Federation (ECF) may be published on this website for the purposes of recording the results of the competitions. You also agree that such information will be passed to the ECF, the governing body, for grading purposes, and published on their website. The current webmaster is Ray Collett (Worcs). The website's policy is to report results of the MCCU competitions, principally the MCCU county team tournaments and congresses. Brief results of other chess congresses held in the MCCU area and and links to organisers' websites are on the "News" pages. A calendar of upcoming chess congresses is on the "Congresses" pages. Some important national and international chess events will also be reported if there is a "Midlands" interest. In the menu bar above: "About" gives more information about the MCCU and has links to rules and administrative papers; "Guide" explains the site's organisation and provides links to most of the site's key pages. Please send news of Midlands chess events, corrections, notifications of broken links, and suggestions to improve the website to Ray Collett. © Midland Counties Chess Union 2002-2018. All Rights Reserved. Contact us with questions, corrections, or comments about this web site. Read the MCCU privacy statement. Hosted by our Internet services partner, EazyWebz UK.